In this Microsoft Word Tips & Microsoft Word Help page I will show you how to create and employ a document template and Userform. The first section of this tips page provides methods which are universal to all current Word versions (2003, 2007, 2010 and 2013). For a method using content controls with Word 2013, 2010 and a limited bases 2007, see Content Control Method. Note: Even if you are interested in the Content Control Method, be sure to review this section as well. It contains lots of information on userforms in general that you won't want to miss. The boilerplate text of the Student Survey. 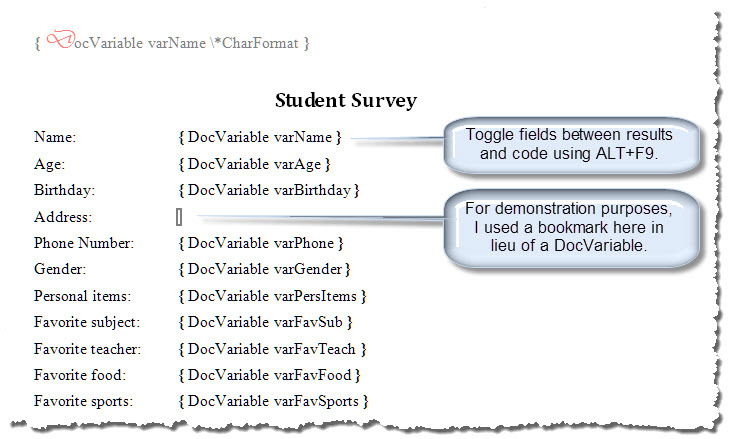 DocVariable fields placed at "most" locations where data entered by students in the Userform will be placed. A bookmark for one specific data element (Address field). A standard VBA code module initialization and processing code. A Userform to provide a graphical user interface with the students preparing the form. The template when a opened in Word 2010 with field codes displayed is shown in the illustration below. Note: If you are using Word 2003 you will use a .dot extension template file. As the template contains a VBA project you must use a macro enabled (.dotm extension) template with Word 2007/2010. On Doug's suggestion, with one exception, I am departing from an often used practice of using bookmarks as place marker\data stores in the document and will use document variables and DocVariables fields instead. Document variables and DocVariable fields are easier to code. You can take advantage of using the \*CharFormat in the DocVariable fields. This lets you add different formatting to the text at each DocVariable field. Note the DocVariable field located in the template header. The data in that field will be formatted to match the "D" in "DocVariable. The exception is that I will use a bookmark for the "Address" information. I want to illustrate a method for putting data "in" a bookmark instead of "at" a bookmark as was shown in the MVP FAQ article. Enter the boiler plate text (e.g., form labels, headings, etc.) and the DocVariable fields and/or bookmarks as required. As an alternative, or you can create DocVariable fields manually by typing then selecting the field code text and pressing CTRL+F9 (e.g. DocVariable varName). Enter the bookmark using the Insert Tab>Link>Bookmark ribbon sequence (Word 2007/2010) or the Insert>Bookmarks menu sequence (Word 2003). 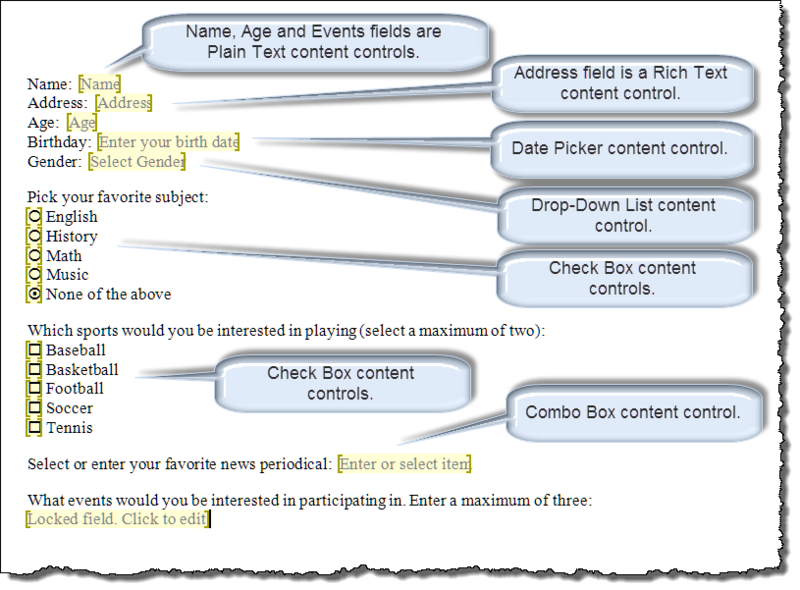 Note: While not demonstrated here, Content Controls introduced with Word 2007 are excellent place marker/data stores in document templates. After you create your template and enter the DocVariable fields and bookmark it is time to open the Visual Basic Editor (VBE) to create a standard code module and Userform object. The standard code module contains the code for initiating the Userform and processing Userform contents and other functions. The Userform object is where the Userform is actually designed. 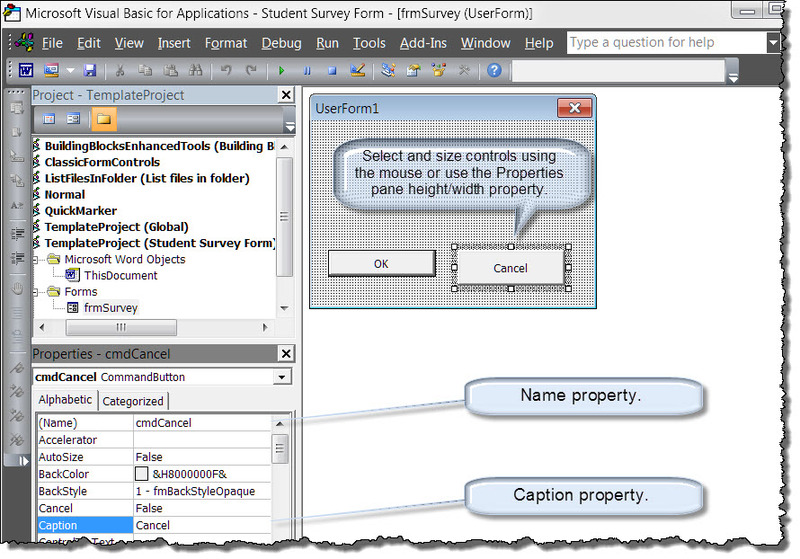 The resulting Userform is presented as a graphical user interface and serves to collect and in certain cases validate student responses to the survey questions. In this Userform I have included most of the common Userform controls. The "Name, Address, Age, and Phone Number" controls are Textbox controls. The "Address" control is Textbox control with the MultiLine property set to true. A spin button control is associated with the "Age" textbox. OptionButton controls are provided for students to define "Gender." Checkbox controls are used for "Personal Items.". The "Favorite Subject" control is a single item select ListBox. The "Favorite Teacher" control is ComboBox control with the MatchRequired property set to true. This prevents the wisenheimer student from entering a teacher that doesn't exist. The "Favorite Food" control is a single item ComboBox. Students can select an item from the list or write in their own entry. The "Sports Program" control is a multi-select ListBox. Students use the CTRL key and mouse to select multiple items in the list. I used a frame control to group the survey questions. There are two command button controls used to process or cancel the form. I used one uncommon but very handy DateAndTimePicker control for entering the birthday. Press ALT+F11 to open the Visual Basic Editor (VB Editor or just VBE). If not already showing, use the VBE menu "View" to display the "Project Explorer" and "Properties Window" panes. In the Project Explorer, navigate to and select the Project "Student Survey Form." Your VBE should look very similar to the illustration below. 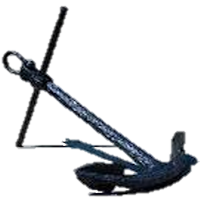 Note: Unfortunately Microsoft no longer includes the Microsoft Windows Common Control-2-6-0 (SP3) in the resource library. You need this reference for the DateAndTimePicker control to work. If you are unable to find it in the list of available resources then you will need to download MSCOMCT2.OCX (see Office Help & Support KB 297381). Once you save MSCOMCT2.OCX in your system directory (e.g., C:\Windows\System32 on 32-bit or C:\Windows\Syswow64 on 64-bit), you need to register it. Click "Start" then "Run," type in regsvr32 and then the path to the file e.g., c:\windows\syswow64\mscomct2.ocx, then click OK. If you don't want to go the trouble of doing this, I have included a second Userform in the .dot version of the Student Survey Form template that substitutes a Textbox control for birthday and omits the DateAndTimePicker control. Use the VBE Insert menu to insert a "Module" and a "Userform." This creates a new Module1 and Userform1 object in the project. Use the "Properties Window" "Name" property to rename the code module and Userform to "modMain" and "frmSurvey" respectively. Double click on "frmSurvey." This will display the Userform object and the Control Toolbox. Click and drag two command button controls onto the Userform object. Select the CommandButton1 control and use the "Properties Window" "Name" property to rename the control "cmdOK"
Use the "Caption" property and change the caption to "OK"
Select the CommandButton2 and rename it "cmdCancel" and set its "Caption" property to "Cancel"
Position and size the two command buttons to suit using your mouse or "Top|Left|Height|Width" property fields. 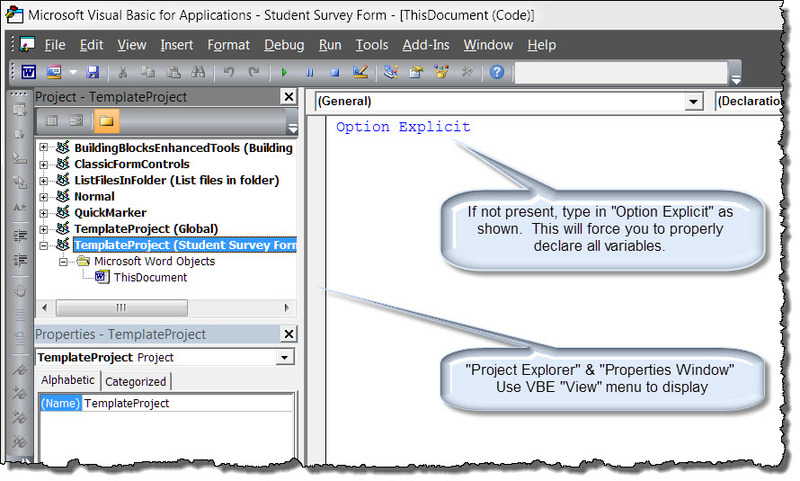 Right click the frmSurvey object in the Project Explorer and select "View code." This displays the form code pane. Click the "General" dropdown on the left hand side of the code pane and select "cmdOK"
Click the "General" dropdown again and select "cmdCancel"
This inserts the default "Click" event procedures for the controls. 1. You can step through a VBA procedure from the VBE using the F8 key. Give it a try. As you step through the code you will see your Userform be created and displayed. Click either "OK" or "Cancel" and you will see it disappear. You will now need to enter the remaining controls and set their respective properties (i.e., name, caption, background color, foreground color, font, MultiSelect, MatchEntry, etc.) using the Properties Window, create the event procedures, and expand the processing code to complete the form. I am not going to step through the construction of each control or the event procedures. Instead, you can download the complete template (Word 2003 and Word 2007/2010 versions) with all the code from the tips page demo pack link at the end of this tips page. I will review some of the event procedures and the processing code in the discussion that follows. You may have noticed that the ListBox and multi-select ListBox in the example form has items displayed and one of the "Gender" option buttons is selected. This is accomplished using the Userform "Initialize" event. This event establishes the conditions in the Userform when it is initially displayed to the user. 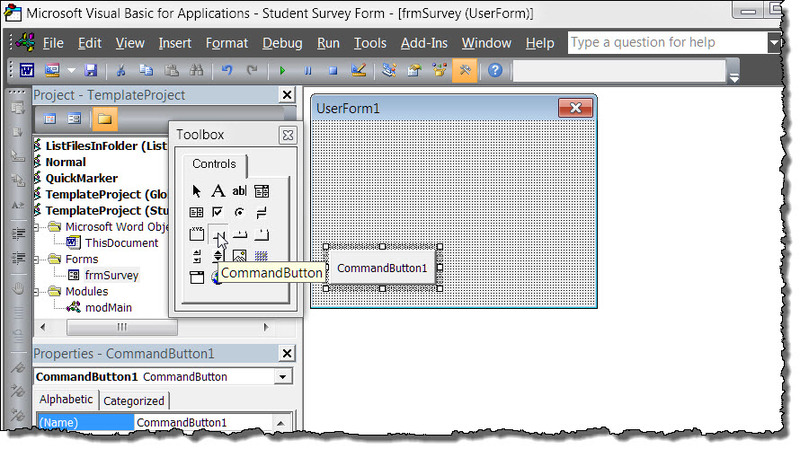 The code used to initialize the Student Survey Userform is shown in the pane below. It illustrates how to set the state of an OptionButton control plus several methods for populating o Listbox and Combobox list members. The .List method makes quick work of larger lists loaded from an array. The spin buttons are used to increment the value in the age field by 1 each time the spin button control is pressed up or down. The code for this control is shown below. You should see that the upper limit is 120 and the lower limit is 0. Students being students, you might want to validate some of the Userform inputs. While the spin buttons are used to increment the value in the "Age" field, we want to ensure that only a numeric value less than 120 is entered. We are also going to use the "Age" field input to set the year displayed in the DateAndTimePicker control to a value near the the students birth year. MsgBox "Contact Guinness World Records!!" You might want to validate and format the data entered. The phone number field in the Student Data Form formats the number entered as: (###)-###-####. For more on validating text entries in Userforms, see my: Validate Userform Text Entries. 'The public variable boolProceed is shared with the CallUF procedure and is used to determine if the student processed or canceled the form. 'Place it at the top of the frmSurvey module immediately below the "Option Explicit" statement. MsgBox "Please fill-in your name." MsgBox "Please fill-in your age." MsgBox "Please fill-in your address." MsgBox "Please fill-in your phone number." vbExclamation + vbOKOnly, "Don't know your gender?" form was processed or if the student canceled. to ensure address entry is properly indented. See notes below. Else: oVars("varFavTeach").Value = "No response"
Else: oVars("varFavFood").Value = "No response"
If .CheckBox1.Value = True Then strTemp = "Cell phone, "
If .CheckBox2.Value = True Then strTemp = strTemp & "Car, "
If .CheckBox3.Value = True Then strTemp = strTemp & "MP3 Player, "
If .CheckBox4.Value = True Then strTemp = strTemp & "Bullwhip." If Right(strTemp, 2) = ", " Then strTemp = Left(strTemp, Len(strTemp) - 2) & "." If strTemp = "" Then strTemp = "No response"
strMultiSel = strMultiSel & .List(i) & ", "
'Clean up the string text. If Right(strMultiSel, 2) = ", " Then strMultiSel = Left(strMultiSel, Len(strMultiSel) - 2) & "." If strMultiSel = "" Then strMultiSel = "No Response"
MsgBox "Form cancelled by user"
1. Notice that it takes two additional steps and lines of code to process the bookmark for the address data. Whenever you place data "in" a bookmark instead of "at" a bookmark you must redefine the bookmark range. This destroys the bookmark and another one with the same name must be added at the redefined range. This may seem like a lot of trouble but it is worth the extra effort. To polish the cannonball, DocVariable fields that point to a variable that doesn't exist can look pretty gnarly when the field result is displayed. 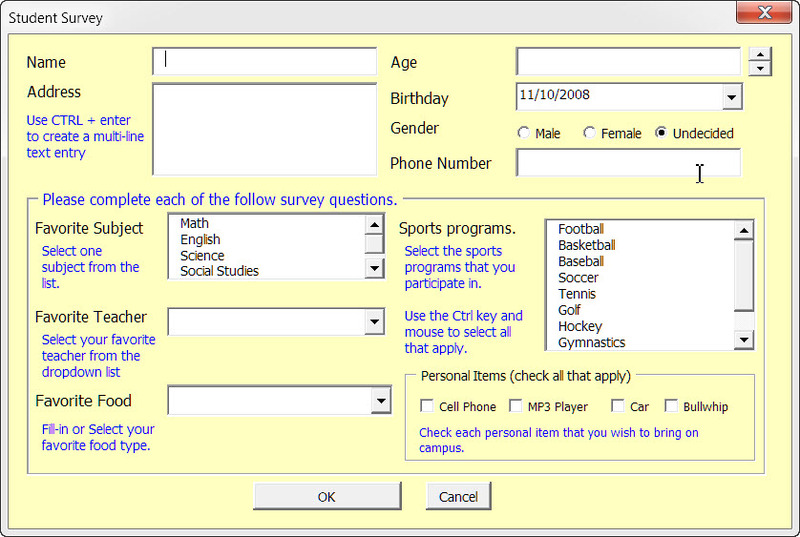 Now all we need to do is deploy the Userform when a student creates a new Student Survey Form from the template. This easily accomplished by adding an AutoNew event procedure to the project module "modMain." With this procedure we will create the document variables and display the form each time a new document is created from the template. See: Installing Macros for instructions on how to set up and use the macros provided in this Microsoft Word Help &amp; Microsoft Word Tips page. In this section I will provide an example of a template and userform using content controls in the main document which serve as target ranges for the data entered by the user in the userform. These content controls replace the bookmarks/document variable fields demonstrated earlier. Content controls can be locked which prevents a user from inadvertently deleting them. Creating interaction between the document and the userform is greatly simplified. The user may recall the userform from the document with the userform mirroring the document content. The example presented here was created using Word 2010. It is fully functional in Word 2013. Unfortunately content control checkboxes were not available in Word 2007. Accordingly the portions of the example template dealing with checkboxes will not function and is not available in Word 2007. Each content control in the document is associated with a control in the Userform. 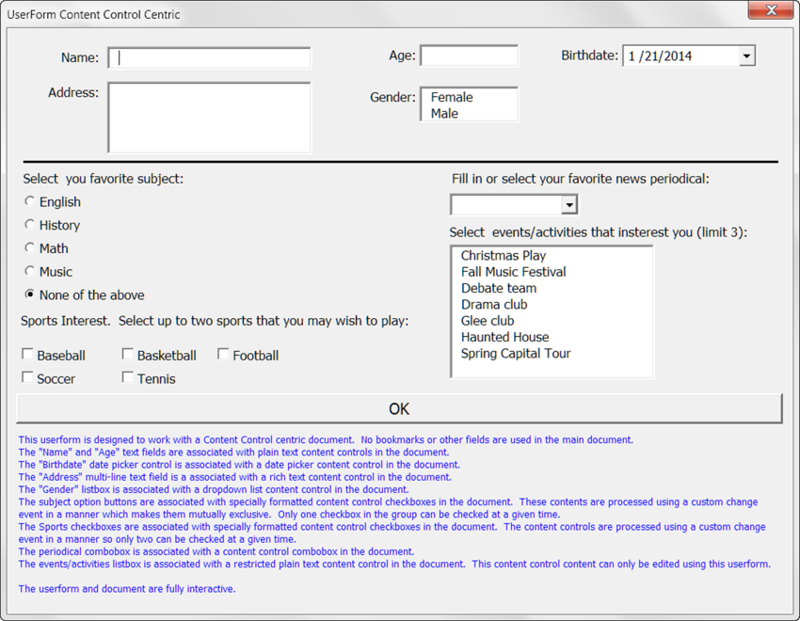 Logic in the Userform and in a custom Document_ContentControlOnChange event work together to ensure that the user is limited to selecting only one "subject" option and up to two "sports" activities. Logic in the Userform ensures that the user is limited to selecting a maximum of three events in the Userform "Events" listbox and converts and inserts the selected items into a properly formatted text string in the document "Events" content control. All of the associated code is available in the template you can download from the Userform Demo Pack link below. For more information on mutually exclusive option buttons, see: Mutually Exclusive "Content Control" Option Buttons. There are several other helpful articles on Userforms in the Word MVP FAQ pages MVP FAQ Userforms or see my: Interactive Userforms and Interactive Userform Checkboxes.